Showing results for tags 'intellilink'. Hey guys. I've noticed some oddities, or maybe it's just normal function, with Intellilink, specifically when doing Media via SD card. I've experienced three different scenarios. First one is when a song is playing, sometimes I'll hit the Browse button and search for another song. What's strange is sometimes it'll automatically open the list of songs at whatever the current playing song is, and other times it'll just open from the very top of the list. I find this somewhat annoying. Second scenario, when Browsing for songs, if I don't give it any activity for a minute or two, it'll just go back to displaying the current song playing, other times it'll stay in the list of song view until I either click back or click a song. Third scenario - by default, the music is set to Shuffle. I was listening to a song by Jason Aldean and had a few others that I wanted to listen to by him, so I opened up the Browse button and planned on clicking the next song I wanted to hear by him once the current one ended. Interestingly.. instead of shuffling, it just went to the next song alphabetically, so another Jason Aldean song. I thought to myself maybe its a coincidence. The next song finished and again it just went to the next song alphbetically. So yea those are my scenarios. Anyone ever experience anything like this? I would say the thing I hate the most is that the Browse button doesn't always take me to the song currently playing within the list, instead it goes to the top alphabetically. Hey guys... I uploaded a video today going over all the details on the new Intellilink system on my GMC Truck. I hope it might help some learn some new tricks. So I have had my truck for just over 2 weeks now (2015.5 2500 HD Denali w/ Duramax) and love it for the most part. That said, I find the Intellilink system a little lacking. It seems cumbersome to navigate from one screen to the next and so forth, in fact, the system in my wife's 2011 Tahoe seems much more intuitive and easy to use. Maybe its just me. What isnt just me however, is the response time of commands given to the system. A few examples: If I press the steering wheel control to go to the next song or back up a few songs, there is a roughly 6-7 second delay before anything happens	The navigation system seems to take a long time to get a signal on startup	When pressing 'rear media' to toggle through the available inputs there is a 5 or so second delay from the time the button is pressed until the next input selection is shown (this is for the RSE system)	If going to the home page to access a different screen that the one being used there is again a significant pause before the system repsonds to your input request. Overall, the entire system just seems sluggish. One thought I had was it may be due to my phone, I have several thousand contacts in my phone and if each time I start the vehicle the system sifts through all my contacts could that be what is slowing the system down for a while after initial startup? Anyone else having a similar experience? I used the search function in this forum and Googled the problem as there are obviously other GMC vehicles that use this system and to my surprise, this doesnt seem like a common complaint. Any insight would be much appreciated. Thank you in advance. So I can't figure out how to play a movie file on the MyLink system. I have a 2014 Silverado with the 8" touch screen. I called customer support a couple times and did everything they recommended and still no luck. I have MP4 and DivX movie files on the SD Card and when I try to locate them on the MyLink system it says I have no files on the SdCard. It will locate the music files and play them off the SDCard but no video movie files. The truck is in park and parking brake is set. Has anybody been able to play movie files on their MyLink sytem? Is there another way to play the files like off my Iphone or with the actual DVD in the DVD player? Any help would be greatly appreciated. 2015 sierra slt- intelilink microphone not working..??? Has anyone been able to use the "Projection" feature of their infotainment system to watch a movie. 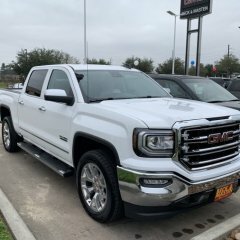 I have a 2016 GMC Sierra with the 7" touchscreen. I can connect my iPhone 5s and appleplay works but I cant figure out how to project a movie. Yes I have read the manual, please be specific about how your doing it so I can tell if my system is faulty. Any help would be great thanks. Okay, who else on here was confused as to what kind of navigation system your truck has installed, or avaiable. I was told I had a Navigation System. When really, I only have OnStar Navigation. Which in the typical description of a navigation system, it is not. Anybody feel like they didnt know what they were getting in their $50,000 truck? Just wondering what software versions yall have, I tried doing a search and couldn't find anything. The main reason I ask is because I saw a video in one of the threads showing how to setup the power folding mirrors, under the comfort and convenience settings, mine seems to be missing those options. 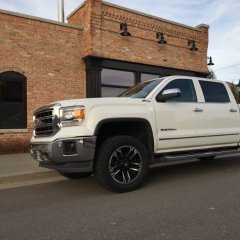 My truck is a 2014 Sierra SLE All Terrain, software version is 23174395.